You asked for a premium aluminum hulled RIB and Zodiac delivers. 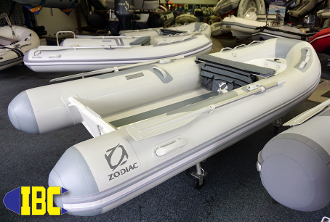 IBC has always been a leader in the field of inflatable boats and Zodiac has always been our partner in new products and technology development. Being in the Pacific NW we are situated directly in the middle of "Tin Town" where it seems like all boats are made out of aluminum. To answer the needs of the middle and high lattitude sailors Zodiac developed a special aluminum RIB with a bow locker and flat deck. Strong, and durable these aluminum RIBs are sure to make a splash with the yachting community as much as with the outdoor sportsman alike.